Obituary for Roy Edward George Jr. | Giunta-Bertucci Funeral Home Inc.
Roy "Sonny" Edward George Jr., 75, of New Kensington, died Friday, Oct. 5, 2018, in UPMC St. Margaret, Aspinwall. 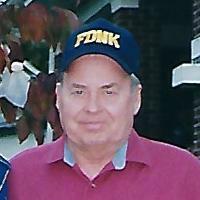 He was born Feb. 16, 1943, in New Kensington, son of the late Roy Edward and Henrietta "Delores" (Szamborski) George Sr. He was preceded in death by his beloved wife of 55 years, Donna Jean (Stadterman) George, in 2017; and a grandson, Brian Rearic. Roy was a 53-year life member of the New Kensington Fire Department Company No. 3. He worked as a paid firefighter for the City of New Kensington and drove tow truck for Hawk Towing in New Kensington until he retired. Survivors include a son, John George, of New Kensington; a daughter, Jamie (Calvin) Rearic, of Myrtle Beach; and granddaughter, Katrina (Paul) O'Donnell, of Freeport. He is also survived by a sister, Barbara (Donald) Nunn, of Texas, and brother-in-law, Paul (Karen) Stadterman, of Florida. Friends will be received from 2 to 4 and 7 to 9 p.m. Monday in the GIUNTA-BERTUCCI FUNERAL HOME INC., 1509 5th Ave., Arnold, PA 15068, JohnPaul Bertucci, owner/supervisor. Burial will be private. To leave an online condolence, visit www.giunta-bertucci.com.